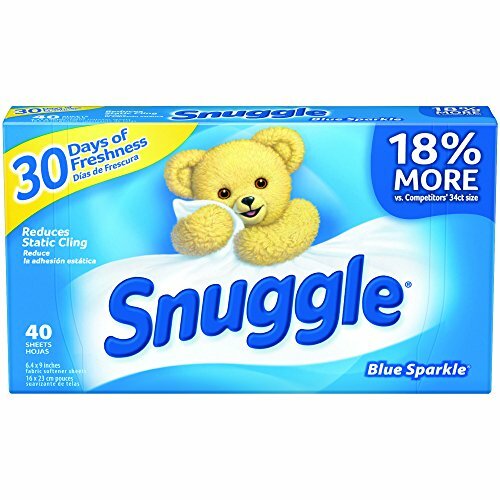 Snuggle Fabric Softener Sheets leave your clothes touchably soft. These individual dryer sheets are convenient to use and leaves laundry soft and fresh-smelling. Adds extra-long freshness to laundry while reducing static cling. Contains enough dryer sheets for 40 loads of laundry. Place one sheet on top of wet clothes before starting the dryer cycle. Dryer sheets are intended for one use only; discard after use. These individual dryer sheets are convenient to use and leaves laundry soft and fresh-smelling. Adds extra-long freshness to laundry while reducing static cling. Contains enough dryer sheets for 40 loads of laundry. Place one sheet on top of wet clothes before starting the dryer cycle. Dryer sheets are intended for one use only; discard after use.